Raybaud, V., Tambutté, S., Ferrier-Pagès, C., Reynaud, S., Venn, A.A., Tambutté, É., Nival, P. and Allemand, D. 2017. Computing the carbonate chemistry of the coral calcifying medium and its response to ocean acidification. Journal of Theoretical Biology 424: 26-36. Introducing their very intriguing study, Raybaud et al. (2017) write that "critical to determining vulnerability or resilience of reef corals to ocean acidification (OA) is a clearer understanding of the extent to which corals can control carbonate chemistry in their extracellular calcifying medium (ECM) where the calcium carbonate skeleton is produced." However, information about the coral ECM is sparse due to the difficulty of accessing it (it is located under several overlying cell layers and has a thickness varying from a few nanometers to a few micrometers). In an effort to overcome this measurement obstacle, the team of eight researchers presented what they describe as "a novel, alternative means of indirectly assessing ECM carbonate chemistry using coral calcification rates, seawater characteristics (temperature, salinity and pH) and pH measurements of the ECM (pH(ECM))." More specifically, this involved (1) calculating coral species-specific relationships between seawater pH and pH(ECM) using pH(ECM) data from six publications on 5 different species that have measured pH(ECM) at several different levels of seawater pH, (2) calculating the aragonite saturation state (Ωarag. (ECM)) and calcium carbonate ion concentration ([CO32-](ECM)) in the ECM from coral calcification rates previously published in 20 peer-reviewed studies and (3) using pH(ECM) and [CO32-](ECM) to calculate the ionic concentration of the other chemical parameters in the carbonate system of the ECM under current and reduced values of seawater pH. This approach yielded a number of significant findings described in the paragraphs below. The species-specific relationships between seawater pH and pH(ECM) revealed that all five of the corals analyzed in this stage of the analysis (Desmophyllum dianthus, Cladocora caespitosa, Porites spp., Acropora spp. and Stylophora pistillata) upregulated their pH(ECM) relative to that at normal seawater pH. What is more, the degree of pH(ECM) upregulation increased as seawater pH decreased, indicating, in the words of the authors, "an active biological control of the ECM chemistry by corals." In the second phase of their work, Raybaud et al. discovered that the Ωarag. (ECM) values calculated from the 20 coral studies they analyzed ranged from 10.16 to 38.31 (mean of 20.41), which values were "~5 to 6-fold higher than Ωarag. in seawater (Ωarag. (SW)), which favors the aragonite precipitation of coral skeleton in the ECM." They also note that "Ωarag. (ECM) was higher for cold-water corals, which have slower growth rates than for tropical ones," adding that "the greater ability of certain cold-water coral species to raise their Ωarag. (ECM) may be an adaptive mechanism, as recently suggested by Hendriks and colleagues (Hendriks et al., 2015), enabling these organisms to grow in seawater that is close to under-saturation with respect to aragonite (Ωarag. (SW) ~1; (Thresher et al., 2011))." Finally, with respect to the third phase of their study -- assessing other chemical parameters in the carbonate system of the ECM -- the authors report that (1) dissolved inorganic carbon and total alkalinity were approximately 3 times higher in the ECM than in seawater at normal pH, (2) carbonate concentration was 5.9 times higher, (3) bicarbonate ions were 2.1 times more concentrated and (4) hydroxide 2.3 fold higher, which observations clearly indicate the ability of corals to biologically mediate the process of calcification in the ECM under present-day seawater pH conditions. But will they continue to do so in the future under projections of pH decline? To answer this question, Raybaud et al. utilized data from a long-term laboratory experiment performed on the tropical coral Stylophora pistillata in order to assess how coral ECM chemistry might change due to ocean acidification. 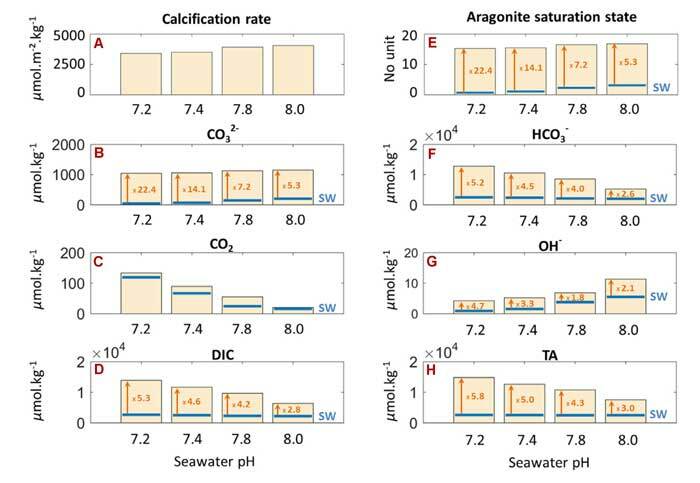 The results are presented in the figure below, which illustrate the impact of ocean acidification on calcification rates and various ECM chemical characteristics of S. pistillata coral colonies exposed to normal (8.0) and reduced (7.8, 7.4 and 7.2) seawater pH levels for a period of one year. As indicated there, Ωarag. (ECM) and [CO32-](ECM) exhibited only small reductions under increasing levels of ocean acidification compared to corresponding changes that occurred in normal seawater. For instance, although Ωarag. of the seawater decreased by 78% (from 3.17 to 0.69, as denoted by the blue horizontal lines in Figure 1e), when the pH declined from 8 to 7.2, Ωarag. and [CO32-] of the ECM each fell by a much smaller 9 percent to values that were 22.4 times higher than those reported in seawater outside the ECM in the most severe ocean acidification treatment (i.e., pH of 7.2). Consequently, the team of researchers write that "the ECM in S. pistillata under ocean acidification has a higher buffer capacity than under current pH," evidenced by the increasing difference between Ωarag. (ECM) and Ωarag. (SW) as the seawater pH treatments decline from 8.0 to 7.2 (see the vertical arrows and orange numbers associated with Ωarag. under the different pH treatments shown in Figure 1e). In light of all of the above facts, Raybaud et al. conclude their results clearly show that "despite unfavorable Ωarag. (SW) [down to a seawater pH of 7.2], corals are able to maintain Ωarag. (ECM) sufficiently high to allow calcification to proceed," as "the biological regulation of ECM chemistry keeps Ωarag. (ECM) almost constant" under ocean acidification scenarios far beyond those likely to ever occur. And that is incredibly wonderful news for those concerned about potential future impacts of so-called ocean acidification on corals. Figure 1. Impacts of ocean acidification on calcification rates and ECM chemical characteristics in S. pistillata. Ωarag. (ECM) and carbonate system ion concentrations were calculated for seawater pH 7.2, 7.4, 7.8 and 8.0 Blue horizontal lines denote seawater chemical conditions for each pH treatment. Source: Raybaud et al. (2017). Hendriks, I.E., Duarte, C.M., Olsen, Y.S., Steckbauer, A., Ramajo, L., Moore, T.S., Trotter, J.A. and McCulloch, M. 2015. Biological mechanisms supporting adaptation to ocean acidification in coastal ecosystems. Estuarine, Coastal and Shelf Science 152: A1-A8.